Darren Rowse is a blogger and speaker, and he's new to the podcasting world. In this episode, he gives a review of the hits, near misses and interesting tidbits of his first experiment into podcasting. Gain honest, real world insights that podcasters, whether newbie or long-timer, will find valuable. 00:53 – What happened since the last episode? 05:05 – Do you need co-hosts when podcasting? 16:08 – Does iTunes help your rankings? 17:15 – Should you have sponsors? 19:40 – Would Darren change things? 21:37 – Short or long podcasts? ProBlogger podcast BTS [Click To Tweet]. Hyperthread your podcasts. [Click To Tweet]. Retro mention your previous episodes. [Click To Tweet]. Space things out. [Click To Tweet]. James: James Schramko here, welcome back to SuperFastBusiness.com. We are on a continuation with this episode. This will be Darren Rowse podcast experiment part two, and of course, in order to make this podcast, I need a Darren Rowse. Do we have any Darren Rowses in the house? James: You are. 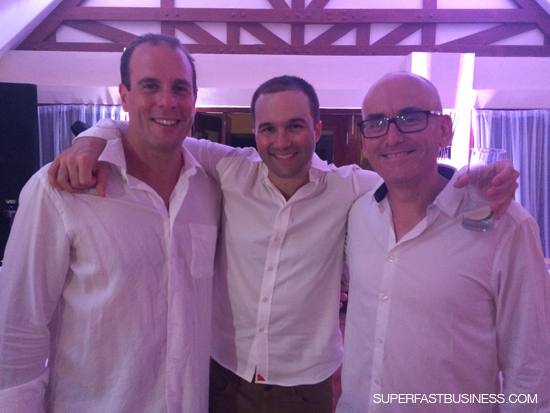 Now, if you haven’t listened to The Darren Rowse Podcast Experiment Part 1, please go and check that out at SuperFastBusiness.com. It was posted on July 1st. At the time of recording here, we are pretty much a month down the track. And since that podcast, you have gone live and I’m really keen to know Darren, what happened? What’s the latest on Darren? Darren: Well, we produced 31 episodes of a podcast and as this is being recorded, I think we published our 29th day in a row. So it’s been a crazy month of a whole heap of stuff going on. We also are two weeks out from our blogging event. So we’ve had a bit going on but the response has been really good. I didn’t really know what to expect from podcasting. Everyone kept telling me, “Oh, you’ll do great because you’ve already got an audience.” “You’ll do great because you’re doing 31 shows in a month and that’s great to get into new and noteworthy,” but I didn’t really even know what that means. I still don’t really know what’s a good amount of downloads but it certainly exceeded my expectations I think, at least ones that I had. James: Right. So in terms of metrics, are you the kind that tracks such things and are these sort of things you like to discuss? Darren: Yeah. I think it’s actually healthy to discuss it because I don’t see a lot of people talking about what’s good. I think we’ve done about 115,000 downloads since we started. We started I think on the 28th of June. So it’s almost a month to the day since we started. It’s not as many downloads as we get visits on the blog, but considering when I started the blog, we were getting like 10 or 15 visits a day. It’s certainly a lot more than that. There have been some episodes that have done a lot better than others, and it’s not just the early ones. There’s been sort of a few standout ones along the way that have had normally high ones. So I suspect that’s just based on the topic and probably the day of the week that they were published as well, there seems to be some trends along those lines as well. James: So in other words, you’re getting several thousand downloads per episode and some of them are probably approaching the 10,000 download mark. Darren: Yeah, pretty much. The first two are just sitting on 9,000 now, so it’s certainly the longer they’ve been live, the better they’ve gone and particularly because we’ve done a 31-day series. They don’t really build on each other but a lot of people are tackling it as almost like a course that they’re working through, and quite a few people are behind because we’ve been putting them out on a daily basis. There’s been quite a few people saying, “I’m only at day 15,” or “I’m only at day 13.” Those are steadily going through and the old episodes are all getting listened to hundreds of times a day. James: Yeah. That’s pretty phenomenal. I mean in terms of stats, I’ve got some benchmarks because I have a few podcasts and I also have friends with podcasts. I’ve noticed your podcast is often in the top 10 in the business category, especially the business marketing, which is probably where a lot of the listener podcasts would be as well. I think that serialized aspect is definitely helping you. The most listened to podcast that I’ve produced have had around 10,000 downloads. But the average one is somewhere around 2,000 downloads per episode. In terms of monthly listens, I’m getting around about 65,000 to 85,000 downloads per month across my podcast. So it’s a couple of thousand downloads a day. I’m not publishing everyday, but I’m probably doing three podcasts a week on average. And for me, I’ve got one podcast that’s constantly in the top 10. That’s FreedomOcean. The other ones sort of bounce around often. Anywhere from 1 through to 25 for SuperFastBusiness, and then a couple sit a little further out, where I have trouble roping in my co-hosts, which has been one of the most fascinating aspects. I seem to be one of the least busy entrepreneurs in my sphere of influence. So it’s probably a good choice that you’ve launched this podcast without needing a co-host. Do you foresee having co-hosts? Darren: I don’t see having co-hosts. I think we’ll definitely incorporate some interviews. I’ve done a survey of our listeners already. They seem to like the single presenter. That was the highest rating. I asked them what type of podcast do you want, and listed out 6 or 7 different types of podcast including single teaching, interviews, case studies, expert guests coming in to do a lecture, and certainly single presenters was what they wanted most. Having said that, that’s all I’ve done so far. So that would be biased. But interviews came up fairly high as well and challenges. They seem to like that sort of element that I am doing as well. Everyday, I’m saying “Do this and that” seems to be going down quite well. So I continue to do what I’ve been doing but also I would like to do a bit more interview-based stuff as well. Although there’s so many of those out there that I’m a bit weary about just going down that road for competing with what’s already out there and some great ones are already doing that. James: That’s a very common premise. But I do believe you can blend them. Certainly, what we’re doing here, like this podcast comes straight off the back of a four-part life lesson series that I’ve published, which is just me monologuing things, talking about influences that I had from my grandparents and lessons that I learned in difficult business situations like the time that my boss spat on me. You can switch around between the two and I found that people like variety, believe it or not. You can buy those boxes of cereal with one of each type of cereal in it and boxes of lollies with different types of chocolates in it. I think, if you can at least entertain people and keep it interesting, then that’s a positive. But one thing that can’t be overlooked with an interview-style podcast is the fact that as a podcaster, you might start to draw in a little bit more reach from other people’s audiences because inevitably, people feel compelled to share when they’ve been on a podcast. I certainly do whenever I’m on someone’s podcast. I tweet it and Facebook it because it’s a nice thing to do and it’s not taking away from you. It’s adding to your ability for people to go and consume some content. So it’d be nice for you to work out which people will resonate well with your crowd, much like you do with your live event. Darren: Yeah, for sure. And I guess the live events and other opportunity for us because we record all of those and have a whole heap of content that we could use in the podcasts as well or at least to use snippets of them and to be able to record interviews at the event in person. So it’s sparked 101 ideas for me as to what to do next. It’s a matter of trying to prioritize those and not take over my life. James: One of the highlights for two of my podcasts were the live interviews at the event, which we podcasted. We did a FreedomOcean episode at FastWebFormula 3 in Queensland. Tim and I, we really performed well with an audience. They were laughing at our jokes in real time. We were feeding off each other’s energy, and then a bizarre thing happened at Manly when we recorded a ThinkActGet episode. The topic was podcasting. We were going through how we put together a podcast. It’s the only time at any of my events where a speaker or co-host in this case actually just left the stage because he needed to use the bathroom. Mid-podcast. It was all captured and it was such a hilarious thing to have happened, but it was all happening and it was being recorded at the event. It was being delivered live and then it was captured on the podcast itself. So you know, never work with animals and kids. My co-host on that one, Ezra, was pretty random. So he just basically said, I’ve got to go. He took off his mic. It would have been even funnier if he’d left the microphone on. Darren: Yes. It could have been more than interesting, I think, or maybe not. James: What was the biggest surprise for you between launching a month ago and now? Darren: I think it was probably the amount of people that I got emailing saying, “Can I interview you on my podcast?” I didn’t expect anywhere near the number that I got of those. I had to put a lot of, I probably have done more of those than actual podcast over the month. So that was certainly a good thing, and I’m trying to do as many as I can because I know that helps with reach but I also don’t want to overexpose myself too much as well. I don’t want ever to hear Darren on every podcast. So that was part of it. I think whilst I knew there’ll be a lot of work in it, I didn’t realize how much in terms of the getting them ready, and show notes, and all that type of thing. And I have taken the advice of numerous people and outsourced some of that now. So I’ve actually got someone on team to essentially produce the podcast. She’s doing a lot of the editing and show notes and that type of thing as well, and also helping us to plan where to from here. James: That is a big factor. Firstly, I feel very privileged that you’ve come to this podcast. Maybe, coming in the first one planted the seed of an idea for others, but that is a classic example of how I’m looking for content that is not done to death and not out there. I especially love case studies, which I did with Clay Collins and we’re doing together now, where we can see things unfolding like that serialized thing. We don’t know how it’s going to end. We don’t know where you’ll be in a few months from now or a year from now. But it’ll be fun to follow the story. Like that 7-Up series. So finding original angles is a good one. But absolutely having standard operating procedures and a team to sweep for you is the way to go. I have teams preparing show notes. One of the best ways is actually to recycle information from someone else’s show. Just run the recorder and send that off to the team. They can pull out nuggets that you didn’t even know were there. That’s actually how I came up with my Life Lessons podcast. It was extracting three or four other podcasts I’d been on, compiling the best stories and then making us a mini-series for my own show. But definitely once you finish recording, you want to be able to drag that media into Dropbox and not see it again, until it’s coming out on iTunes. Darren: It’s been such a relief to do that. I get all these little pop-ups on my screen when she’s uploading new things to Dropbox and it’s really satisfying to know that I’m not doing any of that. It’s great. James: How many people have approached you for them to be on your show? Darren: Not too many. I think that’s because I haven’t done any interviews yet. I kind of announced I’m doing this 31-day series. A lot of people I guess just saw that and thought that there was no opportunity for it. There has been a few people dropping hints I guess. But yeah, not too many. James: I expect you’ll get a few. What we have is a filtering process for both requests to being on someone’s show and for people who request to be on our show. It’s fairly rare that we’ll accept someone’s suggestion that we interview them because most of them are just part of a PR net and a formal outreach program. And that definitely means they’re going to be saturated and everywhere else. But when it comes to people asking us to be on the show, our team will actually go and look at the site, see that last five podcasts, see if it’s a good look and feel, and a level that we would like our content to be on. And then they might ask me if I’m interested. So there’s a little process there. Now, having just been through this situation of launching a podcast, what happens after the 31-day series? Darren: Yeah. So part of that’s come out of the survey that we did. I think I launched that on about day 15. So we’ve had a good week of data so far and several hundred people have taken part in that. We’ve found out quite a bit about our readers. Some of it was a bit surprising: 70% are female, which I didn’t expect at all, and 20% haven’t started a blog yet, which is kind of strange, because it’s been a 31-day series of things to do on your blog. So it surprised us on that front, but by far, the biggest challenge that our listeners told us about was that they want to learn about how to find readers for their blog, which wasn’t really a surprise to me because that’s quite often what we hear. So the next, I guess series of podcast, series of episodes will be on finding readers for your blog. We’ll be putting two out a week. At least for the next few weeks until our event is finished, and there are more probably do some stuff that was based upon the event and some of the content we collected there. James: Excellent. When you publish your podcasts, how do you use the primary call to action? You mentioned before that you have an action step prescription so to speak. Do you ask people to comment on your blog? Do you ask people for feedback or ratings on iTunes? Darren: Yeah, we’ve done all of that. On the show notes, there are comments. The first few days, we had hundreds of comments that certainly tailed off. They’re trickling in as people are catching up with the series. So that’s one of the calls to action. I’m trying to only do one call to action per episode, maybe two at the most. For the first half of the series, we had advertisers. They didn’t renew for the second half so that freed up some other calls to action, which included buying the e-book that we had based of 31-day series on, and then commenting and reviews as well. So they’re kind of the three things. I tend to cycle through doing those three things. James: The old two-step. Darren two-step Rowse. I’m proud of that form because a lot of people go straight for the jugular, and no one likes it. They see that coming these days, don’t they? Darren: Yeah. Look, I haven’t done that on every single one that I’ve seen, but if I see someone genuinely engaging and getting some benefit, I do ask for the review because that seems to significantly help in rankings. I’ve noticed even one review seems to bump you up a few rankings. So I’m kind of trying to be a bit bold with that. It’s not my natural instinct to ask, but I’ve been forcing myself to do that. So it’s been helpful too. James: Right. Yeah. I’ve always felt that download velocity is one of the prime indicators because you can literally see after an email broadcast the podcast rankings search. Then it sort of subsides back again. Darren: I’m really curious as to how iTunes works because everyone said 31 episodes in 31 days would really help, but I’m not sure it’s really helped our rankings a whole heap because I wonder whether we’re spreading our downloads out too far over too many episodes. I’ll be curious to see what happens when we go back to two a week, whether that helps the episodes rank higher, because so far, we haven’t had a single episode rank in the top episodes. I wonder whether that’s because we’re spreading people so wide across. James: I think you will find that it will help because if you look at the top rankings in the sort of categories that you’re competing in, ones like Seth Godin’s Startup School is just like a micro podcast, then it’s very old, but it’s often in the top 10. Then one of my podcasts, FreedomOcean, is very often in the top 10 and it’s not even once a month that one. But it is the most listened to of my podcasts. So I think there’s a lot to be said for having some deep tentacles. I wonder, with regards to the sponsorship, that’s an interesting sidenote that you mentioned there that they didn’t renew. What do you think was the reason for that? Darren: I think, well they’ve indicated they do want to come back to it, I wonder where there was partly again the 31 episodes in a row, and I’m not wanting to come across too strong to the listeners because we’re topping and telling each episode. They certainly said the results were about what they were expecting in terms of download numbers and that type of thing. So I think they were just waiting to see what happens in the second half and then they’re open to that next conversation now that we’re at the end of the 31 days. If you mention that we have a podcast service that’s not listed on our site, people start creating tickets. What’s the podcast service? How much is it? What does it involve? If I mention pre-done themes. So I’ve learned that organic mentions and cross-promotion of your own site is literally like interlinking between blog posts on SEO level and on a readership level. You can hyperthread your podcasts, retro mention previous episodes, cross-sell products. Just organically mentioning them in the show. And of course if you happen to transcribe it, then everything you say turns into SEO fodder. Darren: Yeah. We’ve certainly found that with the e-book, the series is based on with tenfold sales this month on that, which has been partly because we had a discount code, but mentioning it in every podcast as well, which helps a lot. So yes, that’s driven a lot of sales, particularly since the advertising has gone off. I think that’s increased partly because I’ve got more space to sell it, but also because there’s less competing calls to action I suspect. James: Do you think if you started again you would go with a 31-day series? Darren: I’m not sure. I think it’s a lot to ask someone to listen to something for 20 minutes and then go away and do something for 20 minutes, which is what the idea is based on really. I guess over the month, we created 10 hours of content, but then we’re asking people to go away and do another 10 to 15 hours of work based upon it. The people who are doing that are getting real results. I’m getting emails from people saying they’re having the biggest month of traffic, and they’re really benefiting from it. But it’s a lot to ask someone. They haven’t signed up for a course or anything. So yeah, I’m in two minds. It’s certainly had a big impact on those that are doing it but it’s probably had smaller takeup than it could have if I’d spaced it out a bit more. James: Well I think it’ll give you a good opportunity down the track to retro mention that course for people who are the right cycle in their productivity window to take advantage of it. Darren: For sure. And I’m toying with the idea of setting up an autoresponder based upon it as well so we could actually get people to sign up for it and then they get an email each day to remind them of it, or potentially even two autoresponders. One where they could do it one per day and maybe once every week, they could get one for 31 weeks. James: That’s exactly what I’ve done. I’ve put my OwnTheRacecourse and Wealthification courses on iTunes. And when people sign up for those now, they get sequential emails delivered, and they can consume the videos, the blog posts, the audios in sequence. And the next iteration of that will be behaviorally-based video responses. So it’ll be a course that is delivered when they complete the video in the series and that will fire off the next email. It won’t happen until they complete the video. Darren: That’s great. Yeah. Very cool. James: I think this is where we need to be. I’ve learned a lot about matching people’s ability to implement and execute by studying things like video links. What I found was short podcasts and short videos will have a much higher viewership. That’s where I think the podcast industry is very distorted. You hear some of the big shows with 3-hour episodes. They talk about huge download numbers. But I would challenge them to show that someone actually listens to the whole 3 hours because I’ve never finished one of them. I think people start stuff but then get distracted, or their run stops, or they have to go into the shop, or they’ve arrived at their destination, and they may never pick it up. It’ll certainly double count. And when you look in the stats, it shows unique listens versus total. There’s a big difference between those two numbers. It indicates to me people are chipping away. But what I found with very short podcasts is people are actually able to consume it. When I applied the ideas about this to my training inside SuperFastBusiness, I actually moved our weekly live training to monthly, and members all breathe the sigh of relief. It’s like, hah, thank goodness. I can now keep up with it and I can commit to watching one a month and implementing, and I still feel that’s great value. But once a week, what actually happens is that you create a bit of resistance and a little bit of a feeling of anxiety that the people are not able to actually consume it. So now they’re actually there for feel that it’s less valuable than if you did it in a more spaced out period because now they don’t feel like they’re missing out. Darren: Yeah. I think there’s a certain stress when you look at your podcasts and say 10 unlistened listen to. I’ve actually heard people say that they’ve done some studies into if you get too far behind, you unsubscribe. You’re more likely to unsubscribe than to clear them. James: That’s exactly what I’m talking about. So I found the same by spacing things out, I actually improved my retention. In our anecdotal evidence from when I survey my community about the daily podcast shows is that all of them say, “Yeah, I can’t keep up with it. I’ve unsubscribed. It’s too much.” I think too much of a good thing can really diminish the value. So I think it’s going to be a good phase for you to space them out. As someone who’s highly creative and content-focused, they’re going to be really looked forward to by your audience. Darren: Yeah, I hope so. I’m also really keen to experiment with the different lengths as well. We certainly are heeding the mark in terms of the survey and what people say they want but it’ll be interesting to see what happens to the actual listening habits if we do go with a few really short ones, which I’ve got planned as well. James: I’ve had a lot of 5-minute podcasts before. Very rarely go over the 25 minutes for a show like this. And we’re about at that point now. Only on my co-hosted ones if we’re really on a roll will it go past an hour. I think the record one was on my KickingBack podcast, but we kind of cheat with that because there’s no premise, there’s no structure, there’s no point to that podcast. It’s literally just kicking back, and it allows us the creative freedom to not have any pressure, which is fun to just record a conversation without any agenda or any point. It’s always like a Seinfeld podcast. Darren: Yeah. I guess people will show up to that, with that intent of kicking back to rather than showing up to get some meaty, actionable stuff. James: Exactly. And even though it is laden with fascinating stories and insights, mainly because of my co-host not me, because he’s a wonderfully interesting person. It’s good to be able to produce something, knowing that you can’t disappoint someone because you never set the expectation in the first place. Darren: We never promise that this is going to change your life. James: Exactly. Of all the questions I’ve asked you, I hope I’ve done the audience a good service and asked you the things that are important. Do you think there’s something I should be asking you that I’ve forgotten to ask you, Darren? Darren: I don’t think so. I think we’ve covered the main stuff I was expecting to get through today. James: Good. Well, again, congratulations on putting a podcast out there. I think the numbers that you’ve shared with us, which is very kind of you and very transparent of you to share are a good indicator that you’re on a winner. I think the discussion we’ve had around episode frequency, and length, and premise and topic could be very instructive for someone else starting a podcast. Or perhaps if they’ve got a podcast but not getting the results that they’re looking for, maybe they’ve got a sounding board to think about how they might change it or what they’d change based on the experience that you’ve just shared. I just want to say that in behalf of our listeners, I really appreciate your contribution, Darren. Darren: You’re welcome. Thanks for having me on two times. It’s been great to chat again.